Staff at Savanna Ridge Elementary enjoyed supporting Relay for Life at the Annual Walk at Tradition Stadium in St. Lucie West. Staff members enjoyed taking part in various activities throughout the year to fund-raise for the school Relay for Life team such as Coins for Cancer. 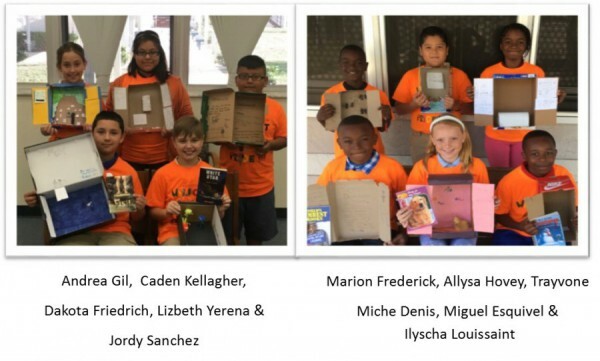 White City Elementary Students Get Creative in Reading! Students from Mrs. Erica Anderson’s 5th grade class who are a part of Mrs. Jennifer Bozone’s small group each chose a book to read over Spring Break. They were given the creative task to create a visual representation of their favorite scene from the book. Mrs. Furtah’s First grade class at Allapattah Flats has enjoyed responding to literature with team work! The students worked together in teams to create a double bubble thinking map to compare the adventures and experiences of characters in stories. First grade students at Palm Pointe Educational Research School @ Tradition recently went searching for a compass. They found it on campus after learning about it during integrated language arts. Great job Rockets! Media time at Palm Pointe Educational Research School @ Tradition is always a fun, learning experience. Kindergarten students recently enjoyed center time in the reading room as sixth grade student Kiana Mehu read Mr. Wiggles to them. Students love when older students read to them! Mrs. Furtah’s First grade class at Allapattah Flats have enjoyed responding to literature with team work! The students worked together in teams to create a double bubble thinking map to compare the adventures and experiences of characters in stories.